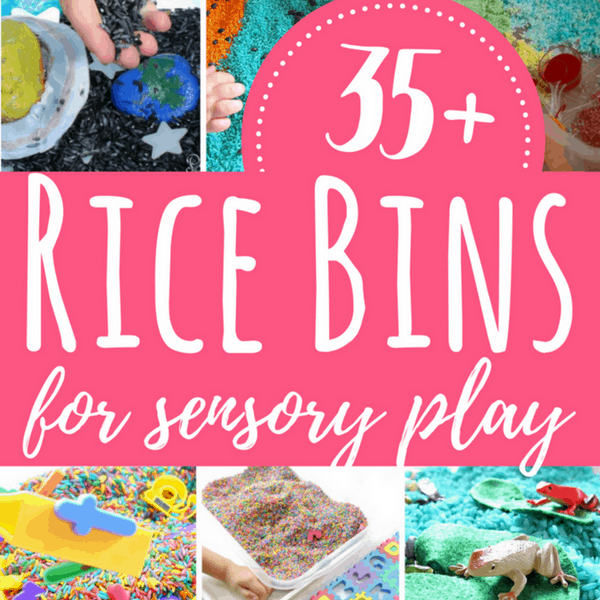 These rice bins are excellent for sensory play with kids. 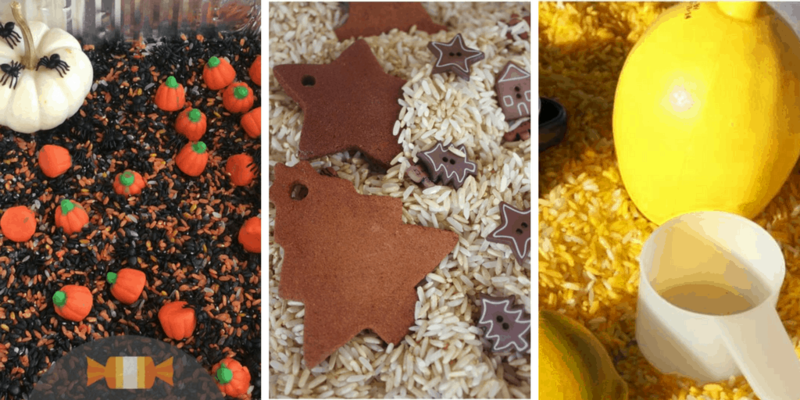 From scented rice and colored rice to seasonal sensory bins, these are great for play & learning. 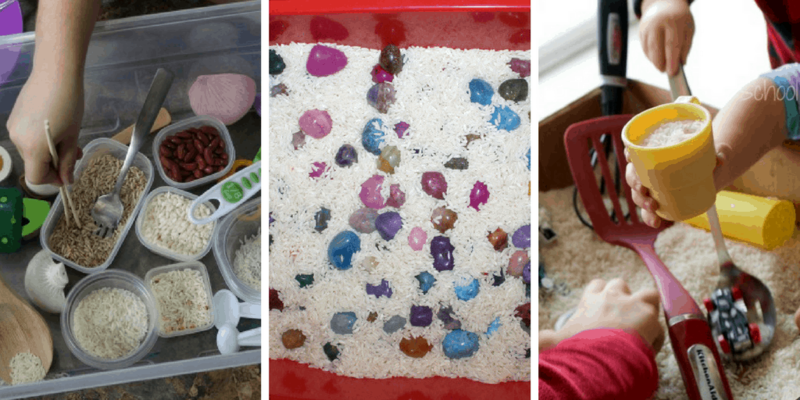 Sensory bins provide so much learning and fun for kids of all ages! Toddlers can play with this and practice their scooping and dumping, while older children can find the process very calming. 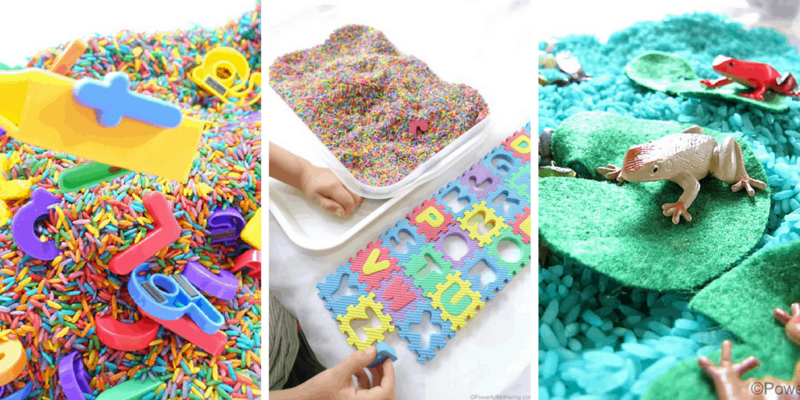 This post contains fun ways to play with rice bins, from colored rice, to scented rice to seasonal bins! 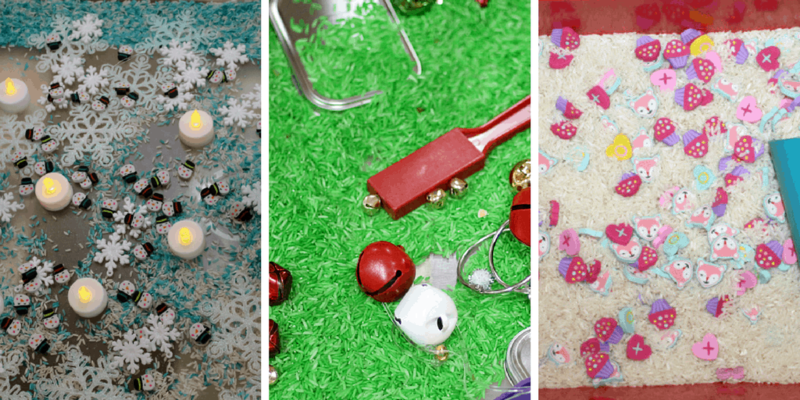 One of our favorite sensory bin fillers is rice. We love to color it, keep it plain, add scent, and more! 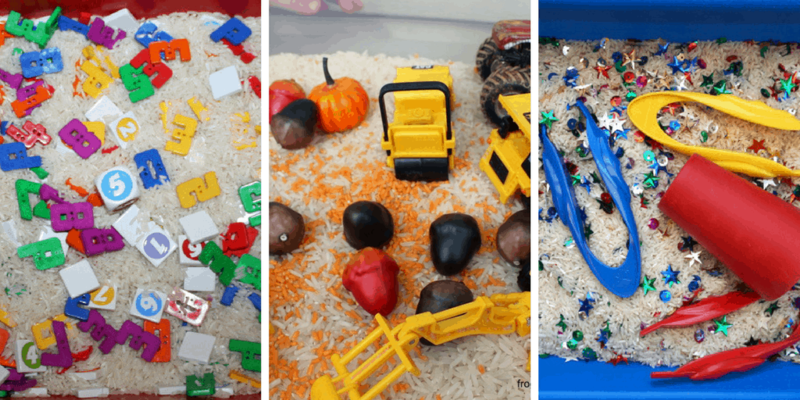 Plain rice provides a wonderful sensory experience for kids, add some fine motor tools, cups and spoons and you’ve got a ton of learning packed into one bin! *A scrapbook paper bin is our favorite. 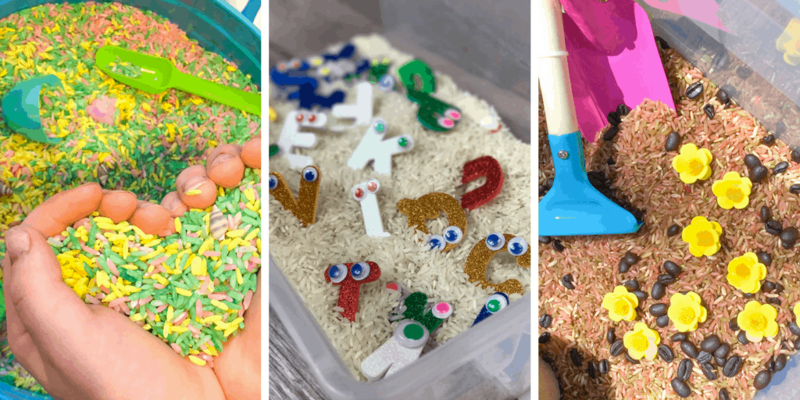 Below is a collection of sensory bins from this site as well as others that all have a rice base. You will find so much inspiration for learning and fun here! Making colored rice is so fun and easy! There are a number off different ways to make rainbow rice, experiment with a few of them and see which you like best! Using flavored extract and essential oils are just a couple of ways you can add scent to your rice! 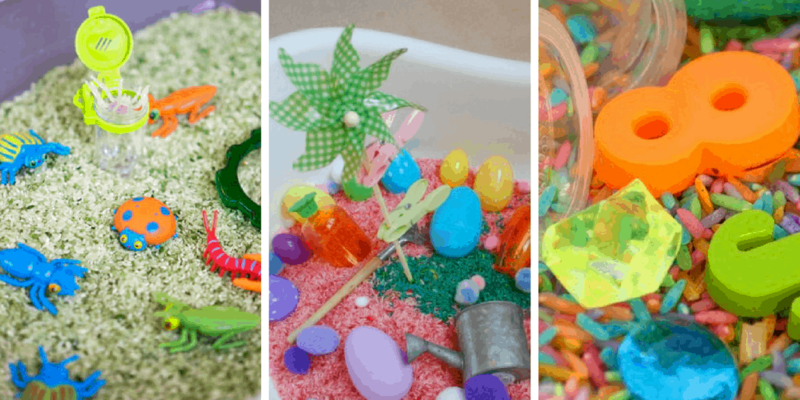 This further enhances the sensory experience for kids, and can provide a fun seasonal flair to your play. 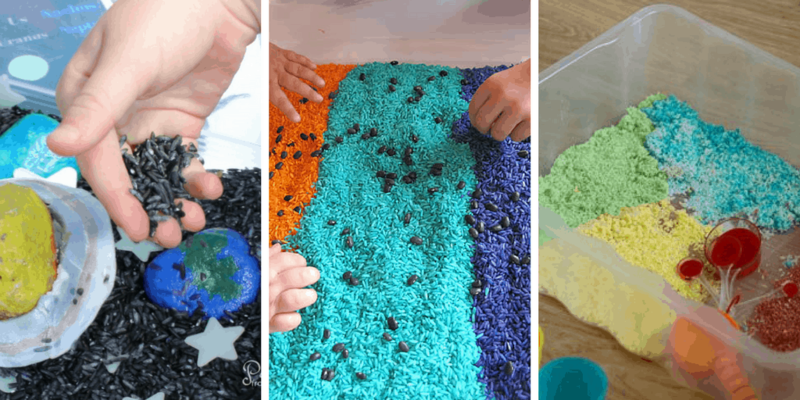 While colored rice is beautiful, you don’t need to add this step to make a fun and engaging sensory bin. Check out some of these below using just plain, white rice! Playing with a sensory bin can be such a fun way to introduce a season or a holiday to kids. By engaging all of their senses, they are really retaining information! Pro tip: When you are ready to pack of the sensory bin, but aren’t quite ready to be done with the learning, put your rice in a bottle and make a fun sensory bottle for another fun way to engage the material! So, the next time you are at the grocery store, grab a big bag of rice and go make a rice bin! Which rice bin will you make first?